Discussion in '1st Gen. Tacomas (1995-2004)' started by davestaco, Sep 13, 2010. I know, I know....SEARCH!, but i cannot find a thred that will answer my questions. But if you know some and could link me to them that would be great! After how many inches of lift does the tacomas steering, diff, and transfer case and drive shaft get all out of wack? what aree the common remedies for the problems that happen when lifting? what lift will clear 32 or 33 with enough room that there is no rubbing? Again sorry for the long post, and the stupid questions. any help would be great! 5100's at 2.5 will fit 33's "with some trimming"
thanks for the quick reply.....and ya i really dont wanna do any kind of pinch weld mods or trimming....and im lookin at a toytec ultimate lift kit with 5100s and full leaf packs and new UCAs. so i was plannin on 3 to 3.5 inches of lift so should i run 32s for no issues? 32's will fit perfect no triming! I got mine and they rub ever soo slightly if the wheels cranked all the way and you hit a small bumb like a curb or w/e. Once you throw a lift in her she'll be mint!! Im gonna lift mine too aswell! thats what i was wonderin....how can i counter act the cv joint issues? thats a nice truck you got there.......is it stock with 32s? so i guess im stickin with 2.5-3 inches of lift and 32s.....now to pick rim size. is 15x10 crazy wide? if i get the 15x8 what backspacing would i need to stick the tires out some? 15x10 will look retarded, go 15x8 with a 4" BS and you'll get about 1/2" of tread sticking out, plus another 1/2" of sidewall for a total of about 1" outside the flares. 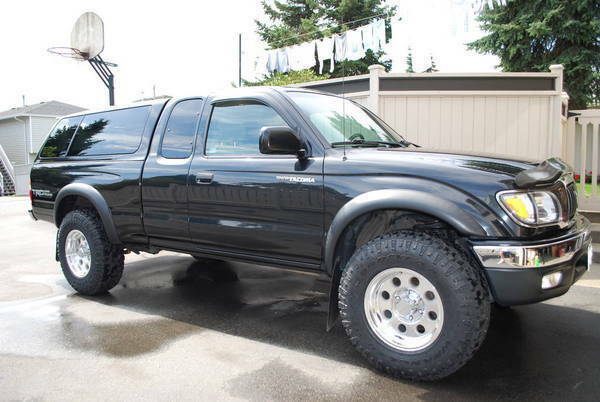 If you have an '01 or greater, you might need a slightly more aggressive BS since those flares are fairly wide. Yea stock with 265/75/16 they come out to be 31.65"
nice rig. your tires are big yeah i think you go with 3' of lifts. im prolly gonna do around 3.5"
If you are going 3.5" with no drop down bracket you will need an aftermarket uca to get your wheel alignment back.